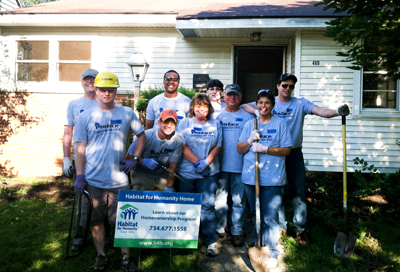 Each year Pro-face America team members grab their hammers and join the ranks of Habitat for Humanity in Ann Arbor, Michigan. Through the work of Habitat, thousands of low-income families have found new hope in the form of affordable housing. Churches, community groups and others have joined together to successfully tackle a significant social problem―decent housing for all. Today, Habitat for Humanity has built or refurbished more than 500,000 houses, sheltering 2.5 million people worldwide. Pro-face America is a regular contributor to the Saline Area Social Services. This local Michigan organization provides support for families in need in the Saline, Michigan area. Non-perishable food items are delivered regularly to their location, which then distributes the items as needed. Each year Pro-face America sponsors an in-house blood drive through the American Red Cross. Employees participate throughout the day in an effort to donate as many pints as possible. Each year the two companies are able to donate approximately 15-20 pints of blood. The last several years have been especially important with our country at war. Pro-face America participates in the Salvation Army Angel Tree during the holidays. Employees choose a child's card from our company Christmas Tree and purchase a gift based on the suggestions on the card. 2012 is the first year Pro-face America participated in this program and it has been a true success.